The manes on the male lions make them look larger and more fearsome. They protect the neck from blows from the opponent. People are fascinated with the fastest, the bravest, the biggest, the smallest etc. The question I get asked the most is, if a male lion and a male tiger were to fight, who would win? 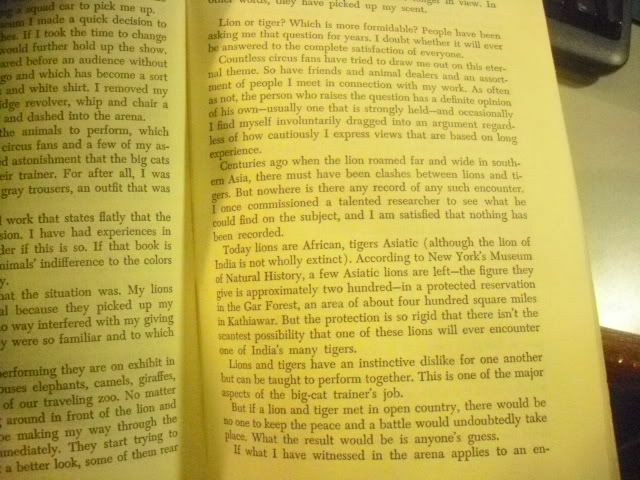 Its a hypothetical question because nowhere in the world, in the wilds, do the lion and tiger co-exist. The social system of the lion and the tiger are completely different. The tiger's social system is far closer to a leopard than a lion. Claws are extended when fighting and the paw speed defies the human eye. The largest wild male tiger ever weighed was 258.2kg and the largest male lion 225kg. Male lions and tigers are powerful in the fore quarters, but male lions tend to taper towards the waist where are male tigers are powerful from front to back. The male lions are slightly longer in the legs whereas Tigers have shorter, more powerful legs, and are extremely athletic. The lion is faster over 100m. Lions can be confined by a 2.4m fence whereas tigers will need a 4m barrier to hold them. Recently Tigress Julie, at 13 years old, cleared a 3.3m electrical fence. I have filmed Tigress Julie catch both monkey and baboon high in tree. A lion or lioness could never accomplish this feat. In the days of the Romans, it was claimed that when lions and tigers were put into arenas, the tigers won the fights. Recently in the Bronx Zoo, a lion and tiger were raised together and according to the keepers, the tiger won all the fights. The tiger was described as "the better fighter, like a clever boxer against a heavy hitter, shrewder and trickier". 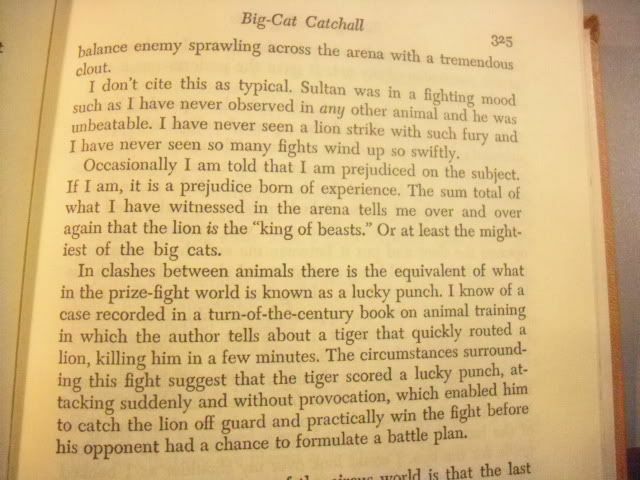 However fighting is also about temperament and I believe one must look to the social system of these two great cats. Male lions will form coalitions and fight together. One male attacking from the front, the other male circling behind for a spine bite to immobilize the opponent. Male tigers will do a large amount of posturing and bluffing before engaging in a fight. This is because they are more of a solitary cat and a serious injury to a male tiger could prove fatal. Then as stated in Newsletter 65, aggression is often genetic. 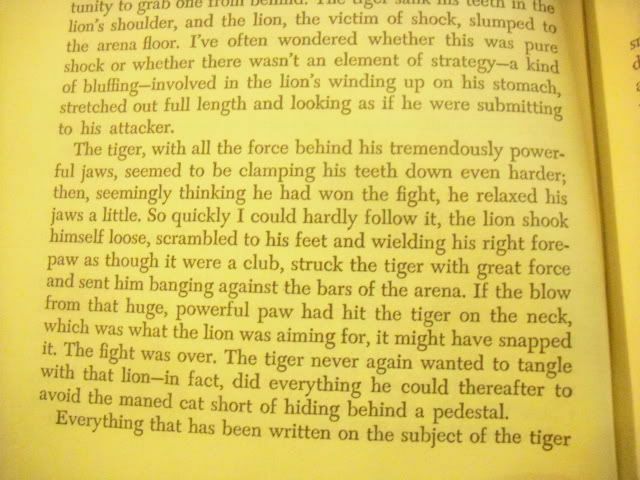 Therefore in a one to one fight an aggressive male lion may beat a less aggressive male tiger. Shingalana mock-throttles me as I lie in the classic prey position. If you study circuses (I hate circuses), you will seldom if ever see a male lion in a circus act. The reason given is, they are just too dangerous. Tigers on other hand, are the most exploited cats in circus acts. Therefore I believe the tigers social system makes it a less aggressive cat. 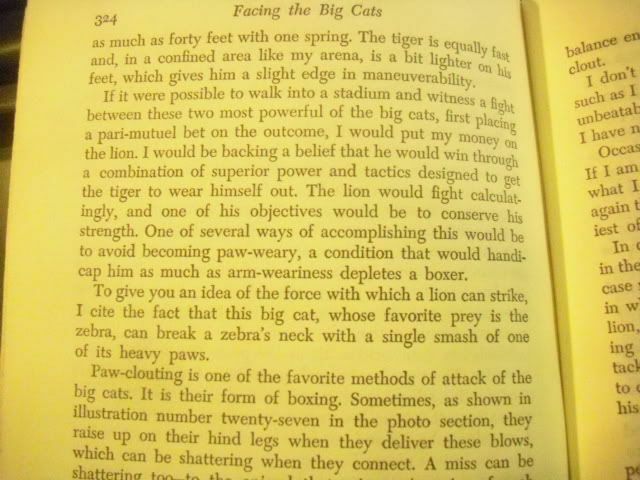 Pound for pound, I believe the tiger is the strongest cat in the world. The male lion, because of its social system, will fight more readily. The bite power of the male tiger is superior to that of the lion. Tiger Seatao regularly cracks large tortoises that male lion would have no hope of breaking. In 2011, Tiger Seatao killed 180kg lioness with one bite. (See Newsletter 41) In terms of strength, I have seen a male lion kill a 800kg buffalo bull on his own. I have also seen a male lion pull a 1000kg giraffe bull over the slippery rocks and across the river. Tiger Ron killed 4 young eland bulls during his life. Each weighed 400kg. Tiger Boy at 10months old, killed an adult eland bull weighing 500kg. In Asia Tigers used to regularly kill Asian buffalo and Gaur weighing 800kg -850kg. Therefore the argument is irrelevant. Rather admire them for what they are, magnificent predators, strong, fast, intelligent, beautiful and endangered. Both lion and tiger are apex predators. They need space, suitable prey and above all protection from us. (Human population now exceeds 7 billion). There are strong indications that the tiger body parts trade is now putting pressure on the lion. Because lions are more readily available, they are being killed and their body parts shipped to China and relabeled "tiger". It is here in the conserving of large wild areas and ex-situ conservation projects that we should put our efforts. Thank you for those who responded to my last newsletter, the information given was outstanding to say the least. I`ve just recently seen a program featuring John Varty, where he says that a lion fight does not match that of 2 male tigers fighting. 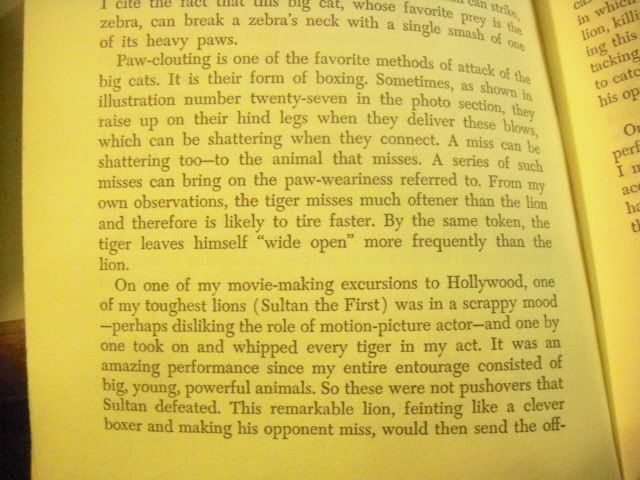 He favors the tiger in a fight with a lion, also. In a fight, the lion would win. In the wild, tigers are heavier (but equal in terms of length & height) by about 5-8%, due to a higher food intake. But, lions are more aggressive. Lions live in groups of from 5 to 40 animals, and, despite all their efforts to avoid it, fights frequently break out between them. Of course, these fights are scarcely serious, but they can often get quite heated and some fights turn fairly violent. 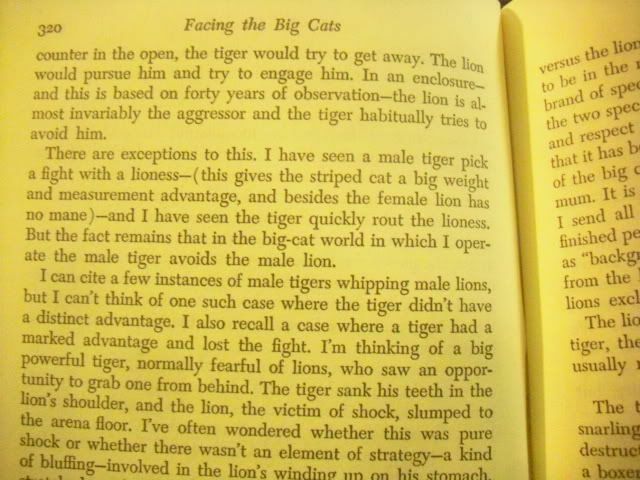 Also, when a valuable resource is in danger, such as when a rival, nomadic male/s invades his territory while his females are in close proximity, or if the newcomer/s decides to roar thus making claim of the territory, the pride male/s will confront the intruders every time if the odds are similar, and even in 3 out of 8 cases (according to at least one study by Grinnell) when the odds were against them 3/1. Packer described this behavior as being suicidal on the lions part. If a single lion confronted a group of 3 or 4 lions (and, single lions have been documented to do so), it is not necessarily with the intention of fighting (but, sometimes they are brave enough to fight anyways). But, even that highlights the aggressive behavior of the lion, as they are willing to confront challengers (depending upon the circumstances) when occasionally outnumbered, which speaks well for the lion. Living in groups, lions are accustomed to fighting, and, having closer-nit numbers compared to tigers, there fights with nomadic lions (which in themselves are generally serious encounters) are that much more frequent. In zoos, you will here the keepers state that it is easier to get a lion to come and fight you than it is for a tiger, but that, at the same time, the first attack of the tiger is more ferocious. I too find that tigers are more ferocious, as when they attack, they stake everything on that first attack, attacking with blue flame fury. However, the lion is relentless, and keeps on coming. The lion is the more aggressive animal. In any fights between the 2....it will be generally the lion that started it. 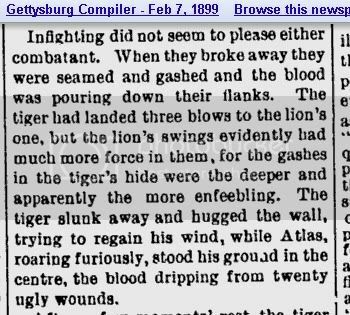 Likewise, once the fighting has begun, it will be the lion initiating the first attacks while the tiger is mainly defensive. Interesting article, thank you very much for it. It seems, for the genomes, reproduction matters above all else (size and compatibility). Because, the animal (genome that makes up the animal) knows if one set of litter doesn't pan out properly, it will have another chance at reproduction and through that it will rectify any previously made mistakes, or something of that sort. Therefore, these events tells me that having any is better than having none. Thank you once again for this very interesting information. Sorry, I can't be of any assistance with similar examples/incidences with other animals, similar or not. I enjoyed the reading.